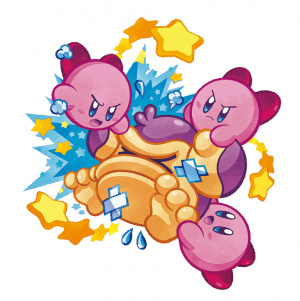 Kirby Mass Attack's enormous army of pink... things is just around the corner, so Nintendo is taking the time to show off some of the bonus games packed into the DS cartridge. As well as the platform antics there are several minigames available, including pest-whacking Field Frenzy, mini RPG Kirby Quest and the pinball-like Kirby Brawl Ball. All that extra content alongside a fully-fledged Kirby adventure? Sounds like some good value to us. We'll see just how good the game is when it's released in North America on 19th September. Wow, now I want to buy this game just for the minigames! Oh, and I'll take the story mode as a nice bonus. I thought there would be like 3 of them that where all going to be a little 'meh'. But that looked amazing. I'll just stick with Kirby Super Star Ultra thank you very much. Although, how extensive do you think the RPG Kirby Quest will be? Thank god they're not using that other music for this trailer. Still, it could be better. Back on topic, though, I'm so glad to see more than just three minigames for once! They aren't all very exciting but I gotta say that Kirby Quest looks like a lot of fun. Those all looks very amazing! Pinball, a Shoot'em Up, Mini RPG, and a few others PLUS the actual game! Oh Nintendo, you spoil us I'm seriously looking forward to this one now. With all these extras its looking a lot like a new KSS to me! I wasn't interested in this game, but the extras are making it hard to ignore. I am officially pumped for this game. Can't wait to get it! I'm so looking forward to this new Kirby game! Kirby isn't just cute... he's hyper-cute! So it is basically Kirby Superstar 2 with the newly announced minigames? Great! Oh wow, the pinball one was just like Kirby's Pinball Land, down to the Wispy boss battle! Now I'm more than excited for this game. Only sixteen more days. Sorry Mass Attack; only one Kirby game for me this year. I'll get you someday. I would play it if.....Kirby wasn't so pink! Now these look like quality minigames. Wow, both Professor Layton and Kirby get a bonus RPG! The question is, which one should I get first? I thought it looked a little gimmicky but once I saw this trailer I think I may get it. I am seriously more interested in the minigames than the game itself now. I. Need, This. Game. Now. OMG this looks amazing! Its like a Kirby version of Retro Game Challenge! Mr. Shine and Mr. Bright! Mass Attack looks like a combinantion of Super Star and Canvas Curse. I can't wait to play this game! This is the kind of quirky, varied game I'd like to see on the 3DS. I don't know why they've only put more traditional, console-ish games on their latest handheld... the DS library seems much better suited to handheld gaming than the 3DS to date. I'm really liking the look of this game. I want the whole game to be like that shooter mini game. Those look awesome! They all look like they could be full games. How much is this likely to cost in the US? and also, is the 3ds region locked for ds games? @Jamouse: normal DS games (e.g. not DSi-enhanced) are not region-locked — you can play them on any region's DS, DSi, or 3DS. DSi-enhanced DS titles, though, will play on any region's DS but must be played on a same-region DSi and 3DS. Let me guess: We Europeans won't get this one either (guess the reference. It has to do with a certain professor!)! Anyway, sounds like nice extra content! Whoa, Kirby minigames have really evolved, we're getting much more from the "minigames" now. Is there anything Kirby can't do? I kind of want to see a full version of Kirby Quest now! That looks freakin' awesome. the minigames alone could be a game. Was as good as bought before seeing the trailer. After seeing it the likelihood of me buying this game went up to a solid 99,99 %. But i still want my full Kirby RPG in 3D on a home console. And maybe a portable RPG with the graphical style of Bowser's Inside Story could work well too. Those minigames look amazing, looks like I might get this one! Anyone considering picking this up ought to do it ASAP. It seems like this is a really awesome game which showcases all of the DS's features. The DS life cycle is now on the decline, so many of the late 2011-2012 games will be hard to find in the future. I'm gonna be on the lookout for hidden gems. It would be great to actually own the "Earthbound" (SNES) or "Shantea" (GBC) of the DS era, when it comes. The trailer music reminds me of Henry Hatsworth and the Puzzling Adventure.